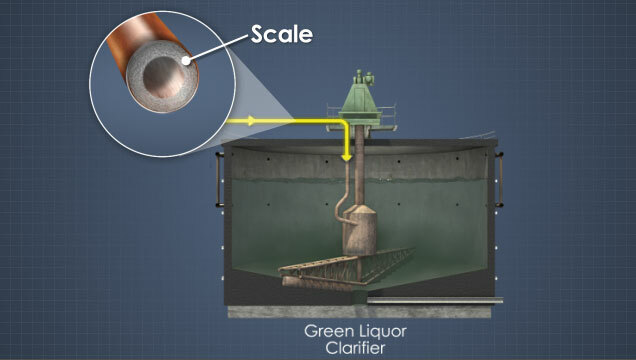 Green liquor is created as a result of mixing smelt from the recovery boiler with weak wash.
To combat scaling issues, typically two sets of lines are used to transfer liquor from the dissolving tank to the green liquor clarifier. 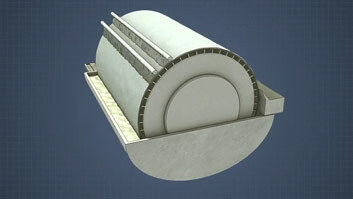 Changes in the density or temperature of the incoming liquor can upset the settling process in the clarifier. Green liquor contains undissolved particulate material called "dregs." 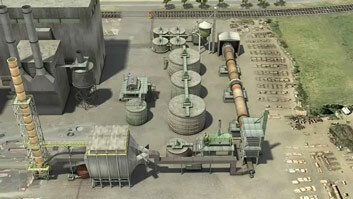 In order to be reused in the kraft pulping process, the green liquor must be converted back into white liquor. The first step in this process is to purify the green liquor by allowing the dregs to settle in a sedimentation clarifier. This module will provide you an understanding of the purpose, function, and operating principles of green liquor clarifiers. How is green liquor created? 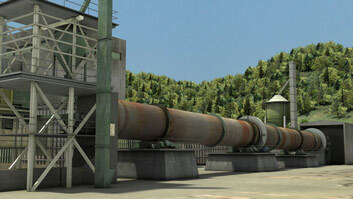 Spent inorganic cooking chemicals from the recovery boiler, or smelt, is combined with ""weak wash"" to create green liquor. 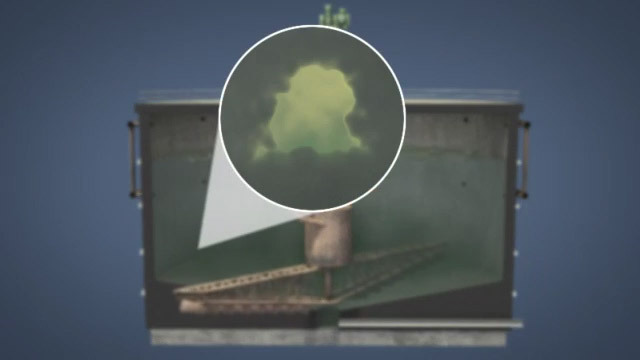 Dregs are the undissolved particulate material in green liquor. How are dregs removed from green liquor? 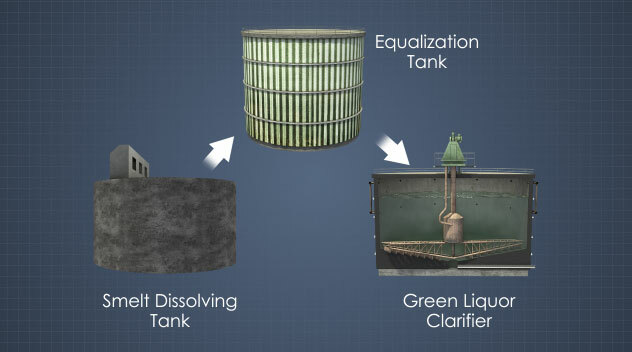 Dregs are typically removed from green liquor by allowing them to settle out in green liquor clarifier. What is the effect of polymer added to a green liquor clarifier? Polymer added to green liquor causes small dregs particles to combine together into larger particles, leading to faster and better separation of dregs. What is ""rise rate"" in a green liquor clarifier? Rise rate refers to the velocity of liquor from the bottom of the clarifier to the top across the entire area of the clarifier. The surface of a particle causes drag on the particle as it tries to fall through the liquor. Think how a skydiver tucks his arms close to his side to reduce drag and increase his speed. 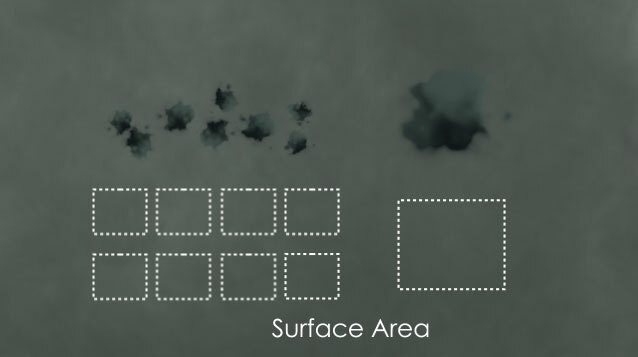 Small particles have a high surface area to weight ratio. A single large particle has less surface area than a group of small particles of the same total weight, so it will fall faster. 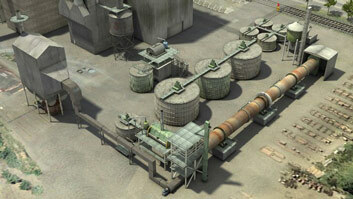 Polymer is a chemical added in small quantities to the green liquor as it enters the clarifier. 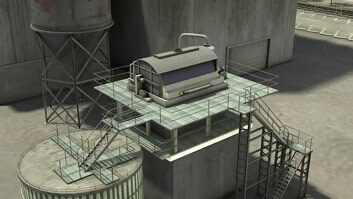 The polymer causes the particles to combine into larger particles leading to a faster and better separation of drags.